Buyers of the newly-released Cat CT630S truck will receive a bonus introductory offer. The first 50 buyers of the Cat CT630S or the CT630SC will get free extended service coverage for five years or one million kilometres, with no limit on fuel burning during that time. Buyers taking advantage of the offer will also receive an introductory package that includes an Oricom UHF radio, a Clarion touch-screen multimedia device, as well as a ‘bling’ kit that adds some stainless steel trimmings to the bonnet, headlights, and bug deflector. The CT630SC is the ‘Superior Cab’ version of the CT630S, and comes with a fridge under the bunk, as well as a TV and DVD player. "The way we see it at Cat Trucks, this special offer marks the arrival of a couple of very special models," Cat Trucks Business and Brand Development Manager Glen Sharman says. The engineering work for the CT630S was all done locally, and is designed specifically for Australian conditions. Both versions of the CT630S have a 550hp (410 kW) Caterpillar C15 engine, and use neither exhaust gas recirculation (EGR) nor selective catalytic reduction (SCR) to meet emission standards. 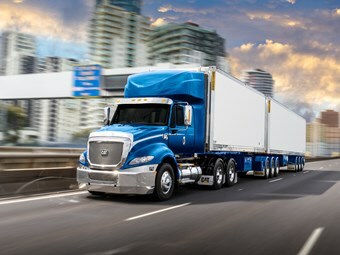 "A huge amount of engineering thought and effort has gone into the development of these new models to ensure their suitability for the unique demands of the Australian market, and specifically the requirements of B-double operators," Sharman adds. Matt Wood recently got to test drive the production model of the Cat CT630S, and you can see what he thought of it here. Find Caterpillar trucks for sale. Search for new Caterpillar specs.